Behind the wheel of Hyundai’s larger, but not largest crossover. Here a crossover, there a crossover. The market is flooded with car-based utility vehicles, offering excellent room, superior body rigidity and decent fuel mileage nearly across the board. Hyundai has two offerings in the crossover department — a compact Tucson (reviewed here last month) and the Santa Fe. A third model, the larger Veracruz, was cancelled a few years back. To fill in the void created by the Veracruz’ demise, a stretched wheelbase version of the Santa Fe is now available. The standard version is called the Santa Fe Sport; the stretched model is simply known as the Santa Fe. Got it? Hyundai has two things going for it when it takes on its competitors: value and excellent warranties. In value, Hyundai pricing is competitive and its products generally offer more equipment standard. Even so, the competition in the midsize utility vehicle segment is fierce with every manufacturer offering at least one model. With warranties, there is nothing that beats a 10-year, 100,000-mile powertrain coverage. Competing Hyundai Santa Fe models include: the Ford Edge and Flex, Chevrolet Traverse, GMC Acadia, Buick Enclave, Toyota Highlander and 4 Runner, Nissan Pathfinder, Subaru Tribeca, Honda Pilot, Dodge Journey, and several others. Standard five-passenger seating gives way to room for six or seven when the stretched wheelbase model is selected. As for the model line at hand, the 2014 Santa Fe Sport is priced from $24,950 and comes equipped with a 2.4-liter, 16-valve four cylinder engine rated at 190 horsepower. That compares with the 2.0T priced from $30,650 and making 264 horsepower. Both models offer standard front-wheel drive or optional all-wheel drive and are paired with a six-speed automatic transmission with a shifting option. No paddle shifters, just a stick that can be moved like a manual gearbox. For a $5,700 price premium, you better receive much more than a 74-horsepower boost. No worries: Hyundai delivers the goods and in spades. The upgrade begins with the wheels as the standard 17-inch alloy wheels are replaced with 18-inch wheels. Because the test model had a navigation package ($1,750), top-of-the-line 19-inch wheels were present. Those wheels come encased in Continental ContiProContact tires, all-season tires that typically grace some of the finer European sedans. They are run-flat tires too — there is no spare tire with the Sport 2.0T. Other exterior upgrades and embellishments for the Sonata 2.0T include: roof rack side rails, heated side mirrors with embedded turn signal indicators, a windshield wiper deicer, automatic headlights, fog lights and a proximity key with push button start. Inside, the cabin is roomy, bright and comfortable. As I pulled myself behind the steering wheel I kept thinking “Azera” as in Hyundai’s larger sedan, what sits in the brand’s sedan product line between the midsize Sonata and the larger Genesis. Nicely bolstered and comfortable seats up front; comfortable seating to the rear. The Sport 2.0T adds in several features not found or perhaps offered optionally in the base edition. This model provides an 8-way power driver’s seat with 4-way lumbar support; a 4-way power seat is for the front passenger. 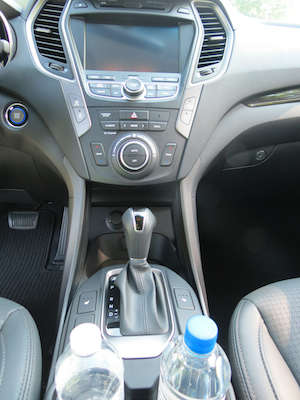 The front seats are heated; ventilated front seats and heated rear seats are optional. Leather seating is standard with the Sport 2.0T, replacing the stain-resistant cloth seating in the base model. Leather wraps the steering wheel which includes secondary driver controls and cruise control. Standard air conditioning is upgraded to dual zone climate control in the Sport 2.0T. All models come equipped with second row HVAC vents, power windows and door locks, front seat back pockets, a split-folding rear seat, front and rear cup holders, in-door beverage holders and storage, illuminated vanity mirrors, and a tilt and telescopic steering wheel column. The Sport 2.0T also brings in rear side window sunshades, sliding and reclining second row seats, a rear view camera and an electroluminescent gauge cluster. Safety features include: blind spot detection, rear parking assist, hill start assist, downhill brake control and active front head restraints. I gave the Hyundai Santa Fe Sport 2.0T high marks in a few areas including its front storage tray, designed to hold your smart phone and places that compartment within easy reach. Located at the bottom of the center stack, that section also includes a pair of 12-volt outlets as well as USB and auxiliary ports. I find that this design is highly useful and trumps the covered center consoles often found elsewhere. The Hyundai BlueLink infotainment system is another plus, one that offers touchscreen access along with accompanying switches and knobs. Directions are easy to enter and can be put in place while you are driving unlike some competitors — then again, that ability can be a huge distraction — it would be better to pull over first or have a passenger handle the input. The 8-inch screen, part of a navigation package, was clear and the voice commands pleasant as well as accurate. On the road, the Santa Fe 2.0T provides generous amounts of power. So much so that you will feel a slight amount of torque steer as you step on the accelerator. All that power concentrated over the front wheels gives a familiar and expected tug — I am curious how that plays out in the all-wheel drive model. That spirited drive comes in handy, especially on the highway. Not once was I left begging for more power. Instead, the Sport 2.0T enabled me to blow past slower vehicles and move away from stop lights with ease. The one demerit I must give this model is for the front end — specifically, the front suspension is equipped with “compact and light MacPherson struts” according to Hyundai (multi-link to the rear). One problem became evident as I was driving along a familiar road and navigating an expected railroad crossing at 45 mph — I was greeted with a jarring and entirely unexpected clunk that shuddered through the crossover. The reaction surprised me although it had no effect on my control of the vehicle. I thought it might have been an isolated incident, but a few days later on a different road and one with a pronounced dip, the sensation was repeated — although not to the extent of what I had experienced at the railroad crossing. Potential buyers living in areas where roads that are rough should keep this in mind when test driving the vehicle. Overall handling is average and braking is good. Even so, this crossover could live up to its Sport 2.0T name with a few improvements in both areas that would set this model apart from its competitors. Given that the segment is so tough, such changes might put the Santa Fe at the top of buyer’s lists. The Santa Fe shines in another area: rear storage. That compartment offers 35 cubic feet of storage space or enough room to bring ample gear for a week on the road with your family of five. Underneath the floor is a compartmentalized storage area, an ideal place to keep your first-aid kit, hide your valuables or squirrel away anything else that you don’t want to have within easy view. The rear storage area size doubles when the back seats are folded, although they do not fold completely flat. 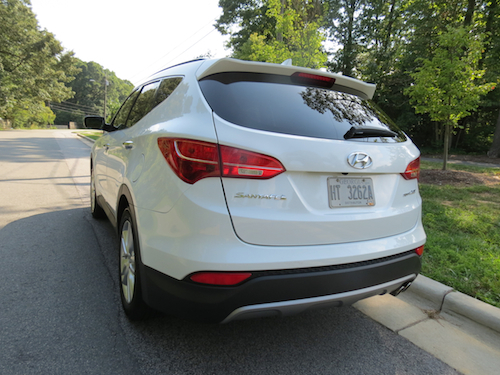 If you are considering the 2014 Hyundai Santa Fe, you get an additional four inches between the wheels and nearly nine inches in added length overall. You also get the Azera’s 3.3-liter V-6 engine making 290 horsepower. Available in GLS ($29,900) and Limited ($33,800) trim, the stretched model rivals vehicles like the Toyota Highlander in size while undercutting its price. 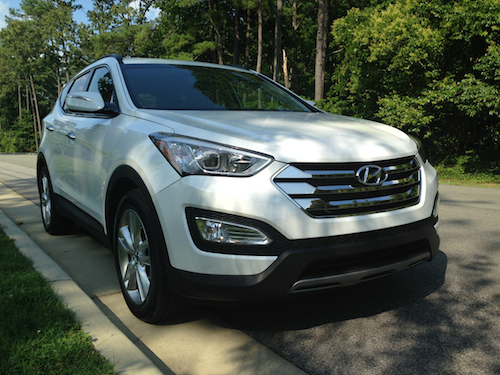 2014 Hyundai Santa Fe Sport 2.0T photos copyright Auto Trends Magazine. All rights reserved.